Stuart J. Murphy's MathStart books use pictures, words and math to teach mathematical concepts through stories. Pictures are important because many children are visual learners. They can grasp new concepts and ideas more easily through diagrams and models than through text and numbers alone. Words are important because they add information, build vocabulary and improve reading skills. And math is important because understanding and enjoying mathematics is an essential life skill. There are 63 books in the series, split into three levels for ages Pre-K to Grade 4. These are the six books that playwright Scott Ferguson adapted to create an original story for The Main Street Kids' Club. 100 Days of Cool (numbers 1-100): When Mrs. Lopez tells her class that they're going to celebrate 100 Days of School, Maggie hears "100 of Days of Cool" instead. What a great idea! Understanding the concept of 100 is a benchmark for children as they become familiar with percentages and place value. Illustrated by John Bendall-Brunello. Captain Invincible and the Space Shapes (three-dimensional shapes): Sam—a.k.a. "Captain Invincible"—and his trusty space pooch Comet have their hands and paws full trying to navigate through the universe. They have to push the right button—the cube, pyramid, cylinder, cone, sphere or rectangular prism—in order to land safely in…??? Recognizing and classifying three-dimensional shapes are an important part of geometry. Illustrated by Rémy Simard. More or Less (comparing numbers) There are lots of game booths at the school fair, but the most popular is "Let Eddie Guess Your Age!" If he gets it wrong, he gets dunked! Comparing numbers is an important part of the understanding the mathematical concepts of "greater than" and "less than," and for developing skills for making logical guesses. Illustrated by David T. Wenzel. Less Than Zero (negative numbers) Perry the penguin really needs 9 clams to buy a new ice scooter, but he's not very good at saving. As Perry earns, spends, finds, loses and borrows clams, he uses a line graph to keep track. Will Perry be able to climb out of negative number territory, pay back his friends, and make enough money for a scooter? The introduction of negative numbers extends a child's knowledge of the number system and is an important concept in algebra. Illustrated by Frank Remkiewicz. Lemonade for Sale (bar graphs) When the kids need to make some money to fix up their clubhouse, they do it in style! Dressed in special "lemon hats," with Petey the Parrot, the club mascot squawking, "Lemonade for Sale!," they keep track of daily sales with a bar graph. Gathering, charting and comparing data is an important skill for assessing progress and making predictions. Illustrated by Tricia Tusa. 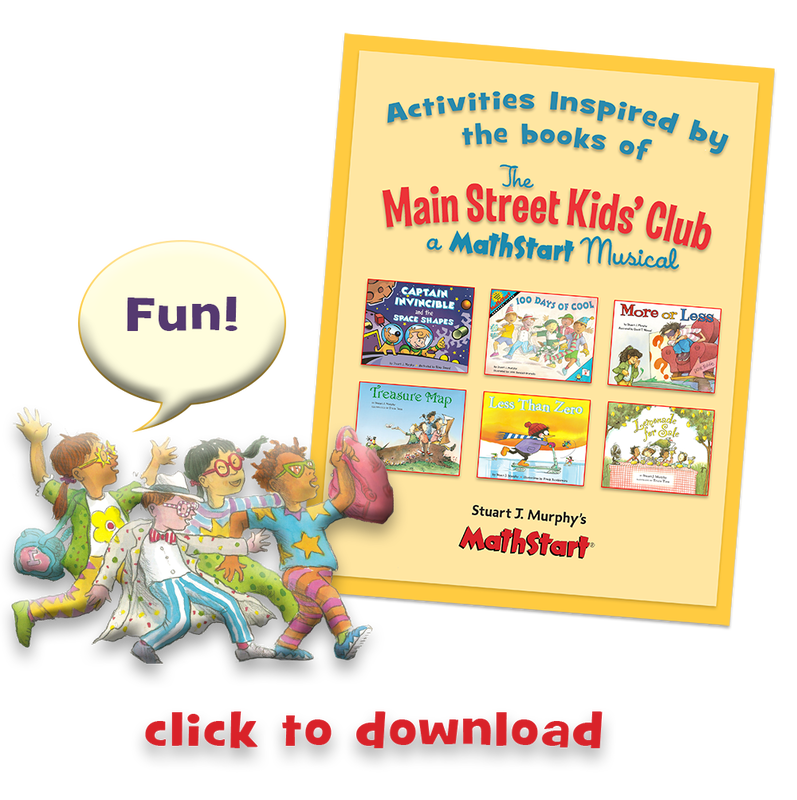 We are so excited about The Main Street Kids' Club: a MathStart Musical, we created a FREE pdf book filled with related activities for each of the six stories featured in the show! Download your copy today! And please spread the word about The M.S.K.C.! Bring a production to your community or school today!